Are investors overpaying for Diageo? Diageo is a low risk company with a long history of progressive dividend growth. But with a dividend yield of just 2.4%, are investors overpaying for its defensive characteristics? 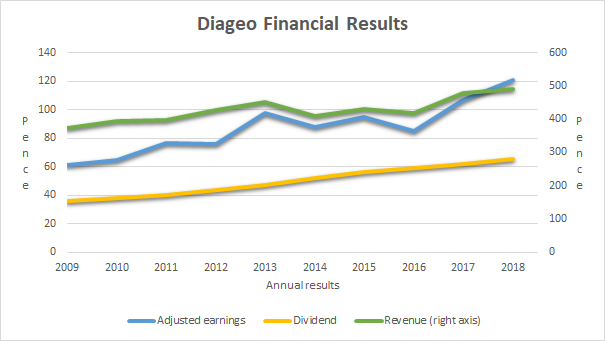 The answer will depend on how quickly Diageo can grow its dividend, so the first thing I’ll do is try to estimate what sort of long-term dividend growth Diageo can realistically achieve. Note: If you haven’t heard of Diageo before, it’s one of the world’s leading beverage companies and owner of brands such as Smirnoff, Bailey’s and Guinness. I wrote a very long review last year (perhaps too long) so have a look at that if you want more background information. As investors we’re obviously interested in future performance and future dividend growth, and one of the best ways to find out what might happen in the future is to look at the past. As you can see, the dividend has grown progressively whilst being supported by both profit and revenue growth. The good news is that Diageo’s dividend growth rate is a very healthy 7.2% per year, which is comfortably ahead of the FTSE 100’s also very healthy 5.4% dividend growth rate. More good news is that Diageo’s earnings growth rate is also good at just over 6%, while the FTSE 100 has a negative 10-year growth rate (largely thanks to the volatile commodity prices increasing and then decreasing the earnings of large FTSE 100 companies such as Shell, BP and BHP Billiton). The bad news is that Diageo’s revenue per share growth rate over the last ten years is quite weak at just 2.5% per year. It’s especially bad news because revenues are the ultimate cap on growth and while dividends and earnings can grow faster than revenues for a few years, they cannot outpace revenue growth forever. If Diageo’s overall growth rate over the next ten years is similar to its revenue growth rate over the last ten years then investors may be very disappointed. Investors would be disappointed because a 2.4% dividend yield combined with a dividend growing as quickly as the historic revenue growth rate (2.5% per year) is only going to produce returns of 4.9% per year (i.e. 2.4% income plus 2.5% growth), assuming Diageo’s dividend yield stays the same. That would be bad enough, but if that lower growth scenario came true then the dividend yield probably wouldn’t stay the same. If the dividend was only growing at 2.5% per year (or thereabouts), investors would probably want a higher yield to offset some of that lower growth. They could quite reasonably demand a 5% dividend yield, which is more typical of mature, low growth companies. So what would happen if that lower growth, higher yield scenario came true? Well, today Diageo’s dividend is 65.3p. If the dividend grew by 2.5% per year for ten years then it would pay a dividend of 83.6p in 2028. If the dividend yield at that time was 5% then Diageo would have a share price of 1671p. To put that into context, its share price today is 2700p, more than 1000p higher than the projected price a decade from now. Under this scenario, the company would continue to grow steadily while investors grew steadily poorer, with a total capital loss of almost 40% over ten years. Of course, this is all pure speculation and this gloomy low growth high yield scenario may never happen. Perhaps Diageo will somehow speed up its revenue growth rate so that it can continue to grow its dividend at 7% per year. But perhaps it won’t, and that’s why I wouldn’t invest in Diageo at its current share price. As a dividend-focused value investor I’m only going to invest in a company if the combination of its dividend yield today and potential dividend growth tomorrow appears attractive. And for me, Diageo’s 2.4% dividend yield and potential dividend growth rate of somewhere between 2.5% and 7% are just not attractive enough. But they’re not terrible either, and I think a small increase in its revenue growth rate and/or dividend yield might be enough to tip things in its favour. What do I mean by small? In terms of revenue growth, it would need to move towards 7% or so at the very least, and stay there for quite a few years. I’m not super-optimistic that this is going to happen. In terms of the dividend yield, it would need to rise above 3% at the very least. Going from a 2.4% yield to a 3% yield might not sound like much, but it’s a 20% increase in the income you receive, and most people would be very happy with a 20% pay rise. By adjusting the underlying data in my stock screen, I can see that a share price of 2000p would give Diageo a dividend yield of 3.3%. To get below 2000p, Diageo’s share price would have to fall by more than 25% and nobody can know whether or not that’s going to happen. However, I think it’s more likely that we’ll see a 25% price fall than an increase in revenue growth to around 7% per year. And while some investors will say that Diageo could never decline by 25%, they probably said the same thing about Reckitt Benckiser in mid-2017, just before it fell 30% over the following year. So I wouldn’t buy Diageo at its current price, but if I already owned it I wouldn’t sell it either. With a rank on my stock screen of 79 it’s in the top half of the 200 companies I track on a daily basis, which means it isn’t cheap but it isn’t horribly expensive either. If halfway up (or down) the stock screen is ‘fair value’, then Diageo is slightly better than fair value, despite its low yield. As a general rule I’ll only buy companies that are in the screen’s top 50, and I start to think about selling when they drop out of the top 100. So are investors overpaying for Diageo? No, I don’t think so. But at its current price I find the investment case somewhat lukewarm. Thanks for this. DGE doesn’t come up on any of my buy screens so I guess we are on the same page. It does feel to me that the universe of companies with a reasonable blend of growth and yield is continuing to shrink. On a more general basis two thoughts. Have you considered stretching your 10 year focus to 11 years? As results for companies reporting for 2018 start to come in 10 years fails to capture how companies performed at the start of the last big recession. Second have you thought about introducing a cash flow measure alongside eps,dividends and sales? Whilst I admit cash flow can be lumpy I like to make sure that over longer periods OCF>EPS and FCF>DPS. Definitely agree. 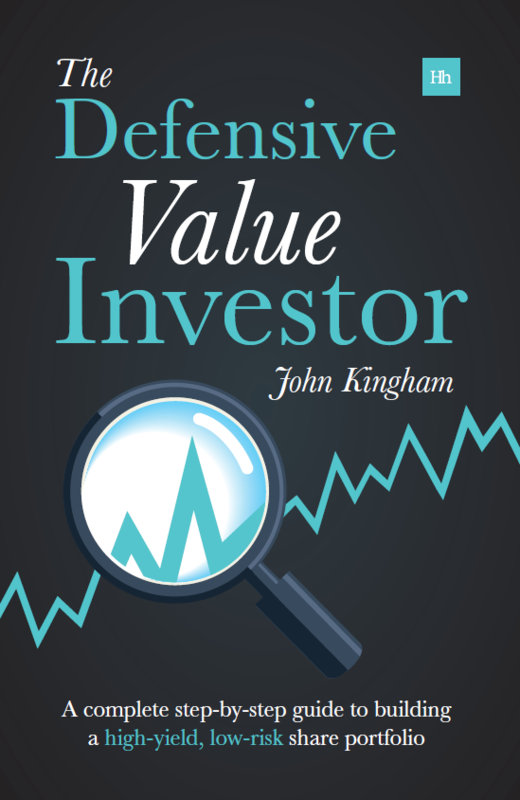 There are lots of opportunities out there if you can be a bit more flexible, but the defensive dividend stocks are mostly too popular to be attractively valued right now. The problem right now is that a lot of companies were struggling with the recession ten years ago, so their 10yr growth rates look exceptional. But that’s just because they were starting from a low point. I don’t plan on changing the stock screen’s 10yr focus, but I do look at longer (and shorter) data when I’m thinking about buying a company. Fortunately SharePad has data going back longer than 10yrs, so I can just look at SharePad to see how the company did before and during the crisis. It’s actually quite useful because you get to see how cyclical the company might be, whether it cut the dividend during the crisis and whether most of the growth over the last decade has in fact just been a recovery rather than true growth. So if, for example, a company ranked very highly on my stock screen and had 10yr growth of 15% per year, but further analysis showed that growth to be just a recovery to previous highs before the crisis, I might decide to side-step that company on the assumption that the next recession might send it back to square 1 again. And I might decide to buy the company after the next recession rather than at the end of a prolonged boom. They look like sensible measures if you’re talking about a ten year period. I used to look at the 10yr FCF / DPS ratio, but didn’t find it especially helpful, although I may have been too hasty in my judgement. Perhaps monitoring it for a few more years might be a good idea. In general though, the other factors that I look out for (e.g. low capex, low debt, low pension, consistent dividends) tend to highlight companies with good free cash flows anyway, at least of the time. Having said that, if one of my investments goes bad and the cause was obviously weak free cash flows, I’ll start paying a bit more attention to FCF / DPS. Thanks for another very interesting analysis about that really outstanding business Diageo. I acquired stocks of Diageo a few years ago at a price of around GBP 20 and it transformed into a very good investment I am willing to hold for decades. I completely agree with you, I would only consider buying Diageo shares when the starting yield stands at least at 3 % in order to ensure attractive or even exceptional returns. It‘s worth being patient and as you said, even defensive and very strong companies like Reckit Benkisser quite easily retreat 20 % to 30 % in price. I was more than happy to pick some RB shares and would love to increase my Diageo position when the price looks more reasonable. What‘s your take about Anheuser Busch by the way? The stock caught my eye as it fell below EUR 80 and now has a dividend yield above 4.5 %. Growth will be sluggish but it has an amazing brand portfolio and could be an interesting income play. What’s your view on that company? Hi FS, I’d be happy to join you as a Diageo shareholder for a few decades if I could buy into the company at the right price. But alas, it hasn’t happened yet. As for RB, I was invested in that one a few years ago but the price shot up and I bailed out on valuation grounds. Again, I’d be happy to reinvest at the right price. And I have no opinion on Anheuser Busch as it’s not in the FTSE All-Share. A quick look at its results in SharePad suggests it’s another consistent growth defensive company, but faster growing than Diageo. The price looks interesting at first glance but as I say, it’s not in the FTSE All-Share so it’s outside my zone of interest! Do I read it correctly that the FTSE-100 has -4.7% annual earnings growth over the last 10 years? That would result in earnings being nearly 40% lower this year than 10 years ago (i.e. 0.953^10). The FTSE 100’s earnings (in index points) were 500, 304 and 486 in 2008, 2009 and 2010 respectively. That’s an average of 430. Its earnings were then 363, 212 and 346 in 2015, 2016 and 2017 respectively. That’s an average of 307. This is mostly (and very approximately) due to large banks and commodity companies making lots of money in 2008 and 2010 and very little money in 2016. If anything, commodities seem to be the biggest driver. However, the FTSE 100’s earnings have rebounded dramatically during 2018 to a new high (although not in inflation-adjusted terms) of about 600, so the negative growth figure will probably disappear into the history books soon. Thanks John. At today’s FTSE-100 close of 7474 that’s an earnings yield of 8.0% meaning the trailing dividend yield of 4.0% is covered 2x. That’s seriously encouraging news, wouldn’t you agree? I think it’s better than where it was, yes. A year or so ago I wrote about how the FTSE 100’s dividend was uncovered and so a small dividend decline seemed quite possible. At least that scenario seems less likely now. I am with Terry Smith on this, I tend not to try and pick winners but instead buy companies which have already won. I still hold Diageo because it is a company which has good cash conversion, ROCE/ CROIC while the free cash flow yield makes it a cheap investment. Until that changes I will hold it. Hi Andrew, it’s a good strategy and Terry has definitely benefited from it these past few years. I’m just a bit closer to value along the value/quality continuum than you and Terry, although I hope to join you as a Diageo investor at some point. I think it depends how you measure value. I tend to go less by earnings and more by cash flow. Not sure this is entirely true John, however, I’m with you on the stretched valuation of Diageo. I sold at 24XX and it’s risen a tad since, however, it does still appear handsomely priced despite the recent suggested better growth prospects. Well that was the announcement prior to the recent emerging markets currency collapse. My reasons for selling were slightly different and mainly due to management actions and, in my suspicious mind, possible fraud. Ivan has done at least two things that don’t ring true for me – one is the rascal Vijay in India that purloined huge amounts of shareholder cash in the sale of the Indian hooch to Diageo and Ivan didn’t seem to bat an eyelid to the ridiculous transaction or to the non recovery of much of the money that Vijay owed Diageo. The second, and the sealing action for me, was the incredible price paid for Casamigo’s and the figure of $1Bn for a brand with virtually no underlying business was unusual, suspicious, and you have to wonder what was in it for any CEO that would grant it. No, for me, there would need to be a complete change of management at DGE before considering reinvesting at any price. So that’s DGE gone and Unilever gone because of mismanagement on a pretty grand scale. (Unilever transfer to a Netherlands only company seems plain wrong). On the subject of a lack of growth companies, I think that’s not the case, but it’s much harder to find them if you set a 10 year track record as the starting point. I happen to follow Unilever again it’s on my list if the price is right. I don’t think I would class it as mismanagement for the intention to move to the Netherlands. If you look in the UK, the government rarely intervenes on a takeover bid. Its happened to Cadburys, which really hasn’t benefited any party including the company taking over. I recall even Buffett publicly criticised Rosenfeld concerning the deal. The only person who made a packet from the deal was Rosenfeld. Therefore if Unilever shifting to Netherlands offers it more protection then it makes sense. Especially for long-term investors who use it for income rather than capital gains purpose. I welcome this decision because the pool of dividend investing company continues to shrink or the yield is abysmal despite the fact that these companies are mature. Complacncy in management is rife when there is no fear of takeover – capitalism exists on the basis that if you are not capable of growing the revenue profitably, someone else will come along and do it for you. If you are in it for the dividend, then the historic growth rate is not going to keep pace, as it has outgrown the profitability for too long now and that can’t continue. Your dividends will be taxed, and should you wish to buy more shares you will be penalised on exchange charges and exchange rates in the future. There is no rationale for the move, Shell manage a full and sensible listing without this. I don’t think its necessary to have the historic growth rate that Unilever enjoyed in the past to get a decent return. Two of the major things that Unilever have that is often over looked is its pricing power it can increase the price of its good by 2-3% annually. Secondly, the capital expenditure for Unilever has in fact shrank. If Unilever is able to increase growth rates of 2-3% but without the-need to increase its capital base then I would be happy with that. Unfortunately, the dividend rate on offer is not a fair price in my opinion which is why I would not entertain adding Unilever stock to my portfolio. For the tax its true it will take a bite for a UK investor but I do follow dividend stocks in the USA so it doesn’t really bother me too much. I would rather have a company not being subjugated by activist investor in for a quick buck if it happens to compromise the long term future of a company. I also think dividend stocks offer some form of protection from complacency. As management are compelled to return a significant portion of cash to shareholder, therefore, they tend to have better capital discipline. They are in no position to shore up performance by using the investor’s money. Reg – I perfectly understand you wanting to defend the position of Unilever, I was taking a similar stance when John penned his article some time back, but I agree with some of the valid things he pointed out in his old article if you scroll back to it you can have a re-read. That’s pretty much my point in terms of the discrepency with the dividend – it’s been growing at 7% a year and growing revenue and profit at 2-3%, so the gap is dangerously closing in terms of the payout ratio – when that reaches a cash crunch point, Unilever will not only have to continue to reduce it’s investment, it will find itself in the uncomfortable position of either having to cut it or cut the dividend, or at the very least start to slow or completely stall the growth of the dividend – when that happens the share price will follow it down. That in itself is a very telling statement – I personally believe that in the event that I believe it is not worth further investing in a company, perhaps you should be owning it at all and look for something that gives a better opportunity cost. I think John’s articles on companies like Ted Baker are cases in point. Whilst it is irksome to consider the positions taken by activist investors, it’s often the case that it happens because of the situation the existing management has put the company in and the change in attitude shocks them into a positive action. Once that complacency resumes, as it will if Unilever becomes shrouded in a blanket of protectionsim inside the Netherlands jurisdiction, the rot sets in once again and they will continue to compromise things like raising dividends above a sustainable level to keep their compensation intact and shareholders artificially on board the ship. On your final point on capital discipline, I see very little of this at Unilever, they paid over $1bn to $Shave which is economically insane for the returns it will provide. Often management need to be seen to do something — I would prefer them to do nothing if it makes little sense. It looks like brokers have already started to downgrade the stock because of these moves so it remains to be seen if the vote passes or not. If it does, look out below, the valuation reset will be worth far more than your next 5 years of dividend income I would wager – well to an extend I have because I sold 4.3% of my portfolio when released Unilever. John, Have you covered Supergroup of late? It’s certainly super cheap right now, has a solid balance sheet and it’s share price is the same now as it was in 2013, yet the business and the profits are close to doubling. Back then the P/E was in the 20’s, today it’s 10.3. I bought in April 2012 at 349 and sold in Oct 2013 for 1047. I don’t expect such a rocket like return this time around, but a 25-40% increase seems highly possible if the online business keeps growing at 25% and they are careful about the hard retail outlets they choose. There is a lot of growth potential in the US and China now that they have the footprints in place. Dunkerton has gone, and they have appointed the nice lady from Hilfiger to give it the once over on the creative side. I must confess that I’m possibly a bit long in th tooth to wear the clobber, but that doesn’t stop me liking the financial returns it offers, or could offer, especially at current levels. Do you mean Superdry? If so then it isn’t on my stock screen as it doesn’t have a 10yr dividend history. The company’s a bit on the new side for me, so once it has a few more (dividend-paying) years under its belt I might take a look. As for the clothing, my preference is for supercheap rather than superdry. Whats your view now they’ve touched £30.00? Start selling down or hold? You say that your shares are going to be used as a pension supplement over the next 20 years, which is fair enough. However, immediately after that you start worrying about a potential 25% share price decline and whether you should sell. Those are conflicting statements, so the first thing I would do is work out what sort of investor you are. 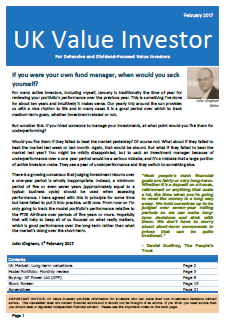 Are you a buy and hold investor (as implied by your first statement) or a value investor looking to buy and sell based on current valuations? If the latter then you need to be aware that a 25% share price decline is irrelevant if the underlying company continues to perform well. In fact, a share price decline is often a good thing because it allows you to buy more of the company (e.g. by reinvesting dividends) at a lower price. As for the £30 price limit I mentioned, for me it’s not an automatic signal to sell. It’s more of a red flag. Personally, if I owned Diageo then yes, I would perhaps be thinking of selling it in order to reinvest into something else with a higher yield, better growth prospects or both. That’s what I’d do as a value investor. If I were a buy and hold investor then I would just hold Diageo as the company itself seems to be ticking along fine. I would either reinvest dividends or draw them as an income, but I wouldn’t be thinking about selling. If I were a buy and hold investor I would only sell if the company was very obviously headed into permanent decline.